How one branch manager helped a customer forget illness and find happiness. Spotlight on Service is a recurring feature in which employees share how they create positive customer interactions. In this segment, North Palm Beach, Florida Branch Manager Michael M. tells us how he helped a customer fulfill the one remaining adventure on her terminally ill friend’s bucket list. Michael stepped up to the challenge and exceeded the customer’s expectations, and she later wrote a note of appreciation for his compassion and attention to detail. Explain a little bit about the customer and her situation. The customer came into the branch one Friday and asked to rent a red convertible the following week to cruise around town with her friend. She explained that her friend was in the final stages of breast cancer and wanted to fulfill the one remaining adventure on her bucket list before cancer took her life. Her friend hoped to spend a day driving around town in a red convertible blaring 50s music — the music of their youth — and the customer was determined to make that happen. How did you help the customer? Once the customer explained the importance of the rental, we elevated her request on our priority list. Finding a specialty vehicle in a specific color isn’t always easy, but we agreed to try our best to make it happen. We started working on her request a day earlier than normal to make sure we could secure a red convertible on our lot, and have it cleaned and ready to go. When we knew everything was lining up perfectly, I called to let her know. She picked the car up the evening before the big day and was absolutely ecstatic we helped make it happen. When she returned the car, she told us her friend had a blast. The pair and a few other friends drove along the ocean in Palm Beach blaring SiriusXM Radio while singing their hearts out. The customer said it was so nice they could all pretend to be young, beautiful and healthy. What’s your secret for providing exceptional service? Exceptional customer service starts with being honest with your customers and setting good expectations upfront. We don’t like overpromising, but we’re certainly sincere when we say we’ll do our best to meet our customers’ needs. From there, it’s all about doing the work so everything else runs smoothly. Did it surprise you that this customer wrote a note of appreciation? Oh my goodness, yes, I was surprised to receive such a genuine note of gratitude. We shared the note with our entire team because receiving letters of that nature make us enjoy working at Enterprise. We get to see our business grow and feel good about the work we’re doing. But all things considered, the customer is the one who went above and beyond. She wanted to honor her friend and fill her last days with respect and fun. She shared her vision of the perfect car with us, and we worked to make that special request our top priority. The fact that she took the time to say such kind words afterward was humbling. She did such a remarkable thing for her friend, and we’re just happy to have been a part of it. I graduated from college in Jacksonville, Florida, and then moved to my home state of New York to work for a financial services company. My wife and I decided to move back to Florida shortly thereafter, so I was on the job hunt. I joined Enterprise because I wanted to be part of a team, and a successful one at that. Enterprise also felt like more of a long-term choice. I had just moved twice in three years and really wanted more than a job — I wanted a career. That’s what I’m building now. 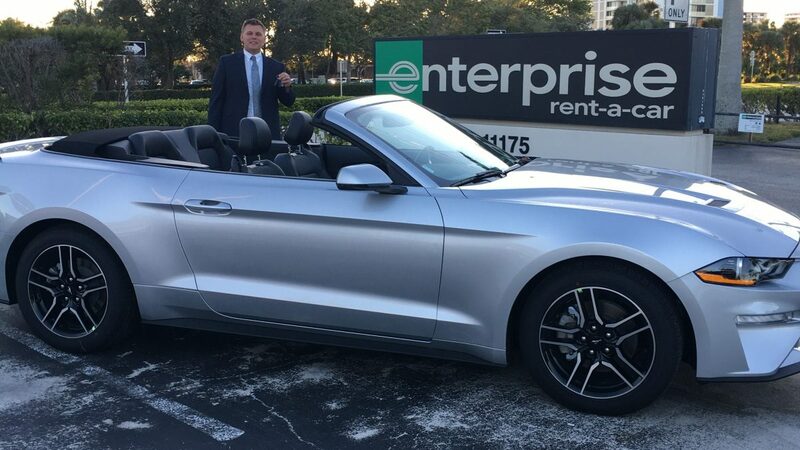 I’ve been with Enterprise since January 2014, and I’ve been a Branch Manager for a year and a half — first at a location in Boynton Beach and now in North Palm Beach.